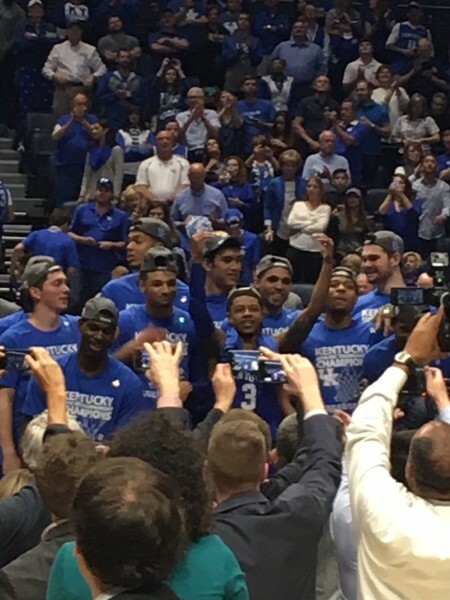 Tyler Ulis and Kentucky celebrate yet another SEC title. Ulis was the difference. Jamal Murray struggled more than he had in quite a while, as his 20-point game streak came to an end at 11 (he still had 17). His backcourt mate, Tyler Ulis, however, was there to pick up the slack. Ulis not only led Kentucky with 30 points, but also delivered the crucial baskets for the Wildcats. Ulis is able to penetrate and find good looks better than just about anyone we’ve seen at his size; in a game that was close the entire way, Ulis was the clear difference. Without him, it’s difficult to imagine Kentucky being in position to garner a #3 seed or making a deep run in the NCAA Tournament. This was a quality SEC basketball game. The hoops side of the SEC gets made fun of plenty, and often rightfully so. This is a league that could get only two of its 14 members into the NCAA Tournament — an unfathomable consideration for a power five conference. But these two teams were anything but embarrassing today. Kentucky is the SEC constant and have dealt with a revolving door of challengers through the year; the Aggies are the newest one, and their balance, experience, and overall talent that was on display this weekend should not be taken lightly in the NCAA Tournament. It’s just a shame there aren’t more such teams in the conference. Texas A&M acted like it had been here before. Despite the loss, the Aggies showed they belonged. Texas A&M is not used to being on this stage, but that certainly did not show. Senior Danuel House was exceptional for the Aggies in scoring a game-high 32 points, including the tying bucket that sent the game to overtime. Four seniors who log a lot of minutes will be gone next season, but the future is bright for Billy Kennedy’s program, as freshmen Tyler Davis, Admon Gilder, and DJ Hogg showed strong signs that they will be able to grow into more prominent roles next season. It’s quite clear why Kennedy was given a five-year contract extension yesterday. Star of the Game. Tyler Ulis. This was a no-brainer, as was Ulis’s selection as tournament MVP. Still, it simply can’t be overstated how good the sophomore guard was today. He had several critical drives for baskets during regulation, and he helped UK begin overtime on the right track with a three after a quick move forced his defender to fall down. Ulis vindicated his selection as both conference player of the year and defensive player of the year with a tremendous final week in the SEC. “You’ve got to give Kentucky credit. They made the big shots to win the game.” – Billy Kennedy, on the difference in Sunday’s game. “He’s played three straight days without coming out and he could probably play 40 more minutes right now if he needed to.” – Alex Caruso, on one of the things that makes Tyler Ulis special. “We’re still not where we want to be defensively, but this team has gotten better all year. We’re finally healthy so when guys don’t play well, you look for the next man.” – John Calipari, on the improvement of his team. Sights and Sounds. As it always is at the SEC Tournament, this was a de facto home game for the Wildcats. Big Blue Nation accounted for at least 95% of the fans in attendance, with Kentucky superfan Ashley Judd among them. Kennedy admitted after the game that the crowd was a big advantage for the Wildcats. “We knew that we were playing in basically Rupp Arena,” he said. Some things never change. What’s Next. Both teams will await word from the Selection Committee as to where they go next. It’s reasonable to believe both will receive a 4-seed or better. While Kentucky may have improved its seeding with the performance this weekend, it’s hard to imagine that Texas A&M did anything in defeat that would harm its standing. The SEC may only get two teams into the Big Dance, but they’ll both be very tough outs. Conclusions are designed to summarize. They are added on the ends of books to pithily sum the events of previous chapters. They tie together loose ends, pull things together. Everything falls in line, any earlier doubts crystallized into a clear and concise synopsis. Everything makes sense. When it doesn’t – that’s when you question, when you wonder, when you’re truly flabbergasted by the events unfolding in front of you. That was the feeling I got Monday night watching one of the most insane first half performances of any national championship game in any season in any level of competitive basketball. Spike Albrecht blew my mind. Yours, too: In the matter of 16 minutes, Albrecht – called into action after National Player Of The Year Award-gathering point guard Trey Burke picked up a sketchy second foul – scored 17 points on 6-of-7 shooting and 4-of-4 from beyond the arc. He entered the game at a precarious time for Michigan, what with their floor leader and undisputed best player sent to the bench, and when he left, Albrecht was a legend. An enormous burst of energy from Albrecht gave michigan a huge jolt in the first half (Getty Images). It didn’t stop there. Louisville responded – check that. National semifinal hero Luke Hancock responded with a ridiculous four threes on four consecutive possessions, all launched from the same general right-wing location, each purer than the one preceding. At the end of 20 minutes, two teams went to the locker room separated by one point. It was one half of basketball, and the nation had already enjoyed quite enough excitement for one night – more excitement than this college basketball season, this no-dominant-team, down-tempo, micromanaged, low-standard-of-play, bring-back-the-good-old-days season provided over five months of games. The running theme in college hoops circles these days goes a little something like this: The sport is irredeemably destroyed, all the way down to its most basic components – team unity, player motivation, coaching greed and, my personal favorite, parity. As if a relatively equal playing field, and a complementary absence of a Kentucky 2012-level alpha dog, is such a bad thing. As if competitive basketball between two evenly-matched outfits on national television in an arena packed 75,000-strong is a detestable element of the game we’ve come to accept, a sign of deteriorating talent and viewability? RTC is reporting from the Final Four in Atlanta, Georgia, this weekend. 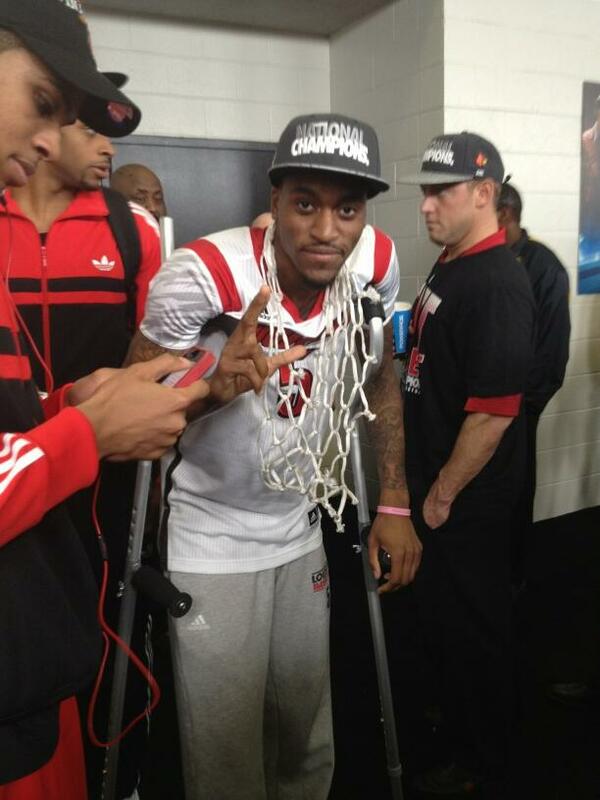 They Did It For Ware, But They Were Going to Do It Anyway. Louisville was the best team this season, and they played like teams that are the best teams typically do. No matter what Rick Pitino says about how the NCAA Tournament field was wide open this year, the Cardinals had the appropriate toughness and ability on both ends of the floor to successfully handle any type of opponent. In both Final Four games this weekend, his team came back from double-figure deficits, and they did so by avoiding any natural tendency to panic on the big stage and having the confidence in unlikely heroes to step up when called upon. It was Luke Hancock and Chane Behanan tonight. It was Tim Henderson and Hancock on Saturday night. Russ Smith was the star of the first four games of the Dance. Peyton Siva and Gorgui Dieng have certainly had their moments. Even Montrezl Harrell and Wayne Blackshear have stepped up when needed. The Cards ran off 17 games in a row after a wild five-overtime defeat at Notre Dame on February 9, and 20 of 21 since late January. The only real question mark with respect to this team was what might happen if the starting backcourt pair of Siva and Smith were both having bad offensive nights — like, perhaps if the pair combined for 15-of-57 (26.3 percent) in back-to-back games at the Final Four? The Cards had the answer all along — a shooter by the name of Luke Hancock (11-of-15) who would make up for what they were lacking on that end. Well played, Louisville. Welcome to the Atlanta Gun Show. In all our many years of watching college basketball, we’re not sure we’ve ever seen a player knock down four consecutive bombs in the way that Michigan’s Spike Albrecht did followed by an opposing player answer with four consecutive bombs in the way that Luke Hancock did. Hancock’s were more rapid-fire than Albrecht’s in that they came literally over a two-minute span to get the Cards back into the game, but Albrecht’s bombing may have actually had a bit of a stagnation effect on the rest of his teammates. With Albrecht playing so well offensively, John Beilein elected to rest his NPOY starting point guard, Trey Burke, for 14 minutes of the first half, and although it’s tough to argue with a Michigan lead taken into halftime, it seemed as if the other major (and necessary) contributors — Glenn Robinson III, Tim Hardaway, Jr., Nik Stauskus — were having difficulty finding their spots. The Albrecht Show was great theater in the Georgia Dome this evening, but it may have had a negative effect for Michigan in the long term by not allowing Burke to facilitate his team better. Why Didn’t Michigan Foul Sooner? With 52 seconds left in the game, Michigan was only down four points but had stepped on the baseline on a rebound to give the Cards a full shot clock again. At the time the Wolverines only had five team fouls. They allowed 15 full seconds to run off the clock before Jon Horford gave one for the team’s sixth foul. Then Michigan allowed another eight ticks to expire before fouling Luke Hancock with 29 seconds remaining to send him to the line for the bonus. When John Beilein was asked about this decision (or lack thereof) to not foul afterward, he said, “I thought we were in the 1-and-1. That was a coaching error.” The gasps of shock were heard throughout the Twitter-verse… how he couldn’t have known the number of team fouls they had seemed borderline ludicrous. It says here that Beilein knew exactly how many fouls there were — he’s too smart and too good of a coach to miss that — but for some reason his players did not follow his instructions precisely in the execution of whom and when to foul — so he’s simply covering for their mistakes. At the end of the analysis, it’s reasonable to still say that the mistake is completely his fault, and you’d be right — but we’re not buying the concept that a coach as accomplished as Beilein made such an egregious error in the closing minute of a National Championship game without more evidence to support it. A Rising Tide Lifts All Boats. We’ve said this many times before this year, but Louisville HAD to win this championship to validate its program as a national powerhouse in contrast to the monolith that resides 70 miles east in Lexington. Nobody on the Cardinals would address the topic, but it goes without saying that Louisville’s “little brother” status in the Commonwealth of Kentucky is a persistent pain in the rear of the Louisville program. Duke became great because Coach K put Dean Smith’s North Carolina program directly in his crosshairs in the mid-1980s; Kentucky’s recent success under John Calipari has put the pressure on Rick Pitino and the Louisville players to counter the Wildcats’ momentum in order to stay relevant. Everyone knows what kind of recruiting class UK is bringing in next season — at worst, the 2013-14 Wildcats are likely to be like the 2010 John Wall/DeMarcus Cousins group; at best, like the 2012 Anthony Davis/Michael Kidd-Gilchrist unit. Louisville knew all too well that this year’s team, with an experienced, tough and talented mix of multi-functional players, was going to be the Cards’ best chance in a while to stem the blue and white tide rising all around them. 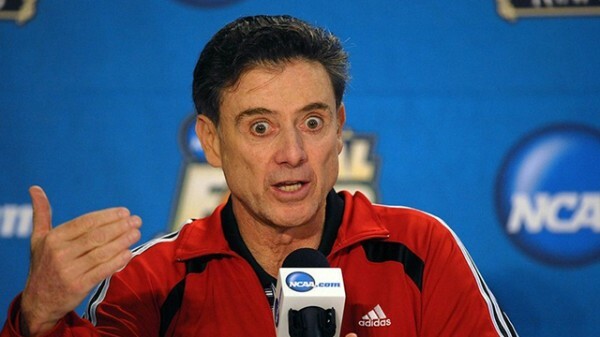 Rick Pitino, having coached at both schools, is no dummy — he and his team weren’t going to waste this opening. Were We Not Entertained? For our money, this was the most entertaining National Championship game since the monster 1999 battle between Connecticut and Duke. (2008 Memphis-Kansas was fun, but missed free throws by the Tigers down the stretch spoiled it). The first half alone was one of the most entertaining 20 minutes of high-level basketball that we’ve ever encountered, and although Michigan didn’t stay tight enough with the Cards to produce a monumental finish, the up-and-down high-flying nature of the game was still outstanding throughout. Consider this: The best offense in the country lost despite hitting 52 percent of its shots and making eight threes; the best defense in the country won despite giving up those numbers and only causing a relatively low 12 turnovers. It was a contrast of styles wherein Louisville had to win an offensive-minded game and Michigan had to manage to find enough stops, and both teams performed admirably in pushing back against the other team’s strengths. This was a masterful finish to a wide open and often-bizarre college basketball season. Star of the Game. Luke Hancock, Louisville. The Final Four Most Outstanding Player had another great game tonight, scoring 22 points and handing out three assists while knocking down all five of his attempts from beyond the arc. He saved his best for last, as his two games here in Atlanta represented his two highest regulation scoring outputs of the entire season. And the timeliness of his four first-half bombs brought the Cards from an 11-point deficit to just a single point right before the intermission. Again, it’s questionable whether Louisville could have won this game without Hancock’s huge and timely performance. Pitino Interview. After the game, Louisville head coach Rick Pitino discussed his team’s long winning streak to the title, the greatness of the game, election to the Hall of Fame, and winning two championships. And after 35 days of the Circle of March, we’re down to just two schools — Louisville and Michigan. We’ll leave it at this for now, but just a reminder to check back on Tuesday for the animated version of the CoM as we narrowed the competitors down from 310 possibilities to just a single champion. Enjoy Monday Night. If you’re under the impression your life is generally going in the right direction, that you’re happy with your family and friends and place of employment, allow me to invite you to reassess: Rick Pitino is absolutely loving life these days. Wait — Don’t you mean will love? 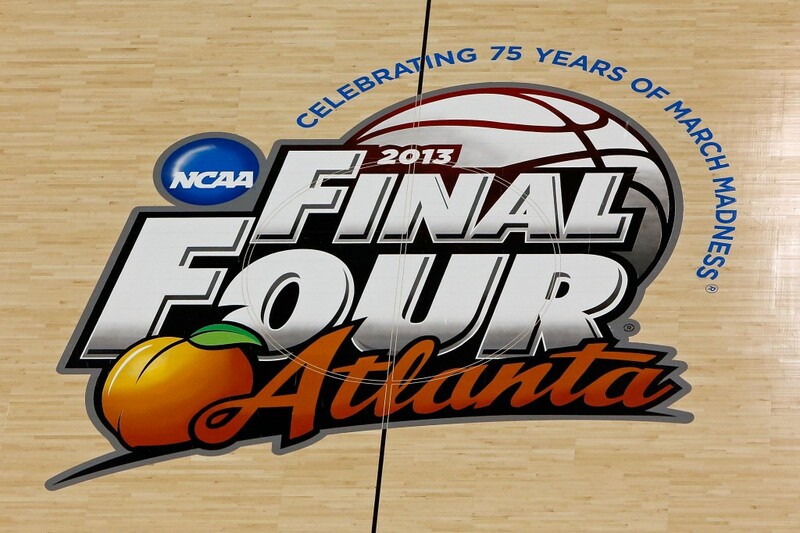 As in, if his Louisville team manages to top Michigan in tonight’s NCAA Tournament National Championship game?. Yes and no. A national championship would certainly lift Pitino’s spirits, just as it would Michigan coach John Beilein’s. But there are plenty of other reasons why Pitino could lose to Michigan, return home to a mildly disappointed fan base and still head into the offseason with a demonstratively optimistic grin. One more win Monday night will put Pitino in exclusive company (US Presswire). First and foremost, in a storyline shrouded by officiating scandal and abusive coaching behavior, is Pitino receiving word over the weekend that he will be inducted into the Naismith Memorial Basketball Hall of Fame. There’s also the personal matter of his son, Richard Pitino, the beneficiary of Minnesota AD Norwood Teague taking a huge leap in coaching faith by hiring the younger Pitino after just one season at FIU. An alternative sporting exploit only adds to Pitino’s mini golden-age – his horse, Goldencents, won the Santa Anita Derby on Saturday, thus making it one of the contenders in the Kentucky Derby, horse racing’s marquee annual event. All of those accomplishments are worth talking about, and Pitino will have an entire offseason to appreciate each in due measure. But the biggest prize of them all, one no other coach has ever accomplished in college basketball history, is something not all fans will enjoy the same way. In fact, one half of one hoops-obsessed state will absolutely detest what Pitino is on the precipice of claiming Monday night. If Louisville beats Michigan, Pitino will have become the first coach to win national championships at two different schools. When people cite intangible qualities like “clutchness” and “savvy” and “composure,” the descriptions typically fall in line with the quantifiable aspects of a player’s game. Otherwise, the descriptions are casual characterizations of ultimately inexplicable qualities. False conceptions are generated, players are ridiculed – he’s no good in the clutch! He’s terrible in the locker room! – and this whole college basketball analysis thing degenerates into a free-for-all personality profiling exercise. I’m likewise reluctant to throw out loose generalizations about any player’s on-court traits, but there is one point I won’t begrudge – the best players should step up in big games. It’s difficult to define what “best” or “big” even means, quantitatively, but if you were to poll any official authority on college hoops about the definition of the terms, they’d point you directly to the two games played in the Georgia Dome last night. The Final Four is as big as it gets, and when last night’s games lay in the balance, waiting to be seized by each team’s starring individuals, something profoundly strange happened: many of those stars didn’t rise to the occasion. 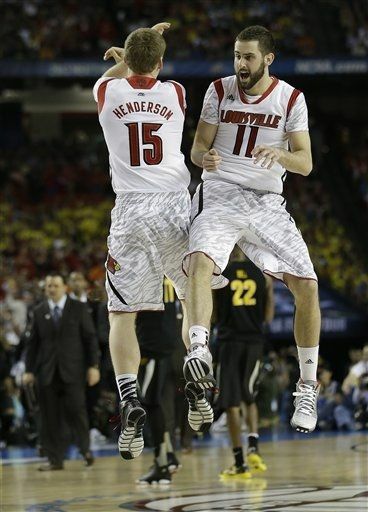 The driving forces behind Louisville’s second half run, Henderson and Hancock, pushed Louisville over the top Saturday night (AP Photo). That’s not odd just because Michigan and Louisville have been sporting “Rise to the Occasion” Adidas warm up gear throughout Tournament play. It’s weird for other reasons, some of them more easy to understand than others. The players who couldn’t meet the demands of Saturday night’s spotlight – Trey Burke, Peyton Siva and Michael Carter-Williams, for starters – created a void of opportunity, which allowed some new faces to step up, greatly affect the outcome of the games and assume the leading roles otherwise dominated by their routinely starring teammates. It’s time to honor Saturday night’s less-heralded stars. Their seasons may not measure up to their household-name-recognizable teammates, but in many ways, the outcomes of last night’s games were the product of their routinely overlooked actions on the court. Tim Henderson, Louisville. The only circumstance under which you could honestly describe Tim Henderson’s performance Saturday night as anything other than “remarkable” is if your name is actually Tim Henderson, and I’m not so sure even he knew he was capable of sparking the game-changing second half rally that lead Louisville past Wichita State in the national semifinal. True story: With the Cardinals trailing by 12 and the clocking slowly ticking into late second-half panic territory, Henderson buried two triples on consecutive possessions to cut the Cardinals’ deficit in half. Wichita State burned a timeout, the Louisville-half of the Georgia Dome crowd reached full throat, and everything snowballed from there. Louisville’s press started forcing turnovers. Wichita State was suddenly crumbling as the momentum shifted in the Cardinals’ favor. It was a major turning point in a second half that, had Henderson not intervened, may have ended just as it began, with the Shockers calmly deflecting Louisville’s defense and matching the Cardinals blow-for-blow and doing everything, almost everything, to knock off the No. 1 overall seed. Henderson stopped Wichita’s upset bid dead in its tracks. Tonight’s Lede. Four Entered, Two Remain. College basketball teams divide postseason accomplishments into two categories. There are national championships, the crowning light at the end of a season-long tunnel, and there are Final Fours, the penultimate step on the ladderer to net-cutting bliss. The paths teams take to reach these accomplishments vary. Some outfits dominate all the way through, much in the way Kentucky obliterated its 2012 regular season competition en route to a national championship. Others peak at the opportune moment. Still others are just downright inexplicable – hey 2011 Butler!. This year’s Final Four offered none of those extremes, but the characterizations were granted willingly all the same, starting with Wichita State’s Cinderella description; or the sudden realization that yeah, actually, Louisville is the “dominant” team existing in a year where the theme of “no dominant team” and “parity” was rammed down our throats to the weekly rhythm of AP Poll variance. Those liberal generalizations were put to the test Saturday night, and at the end, two teams were left standing, awaiting their shot at a national championship, one step away from eternal hoops immortalization. It’s the Final Four, you know the deal – need I continue and longer? Your Watercooler moment. Wolverines Survive Syracuse’s 2-3. Another strong performance in an overall brilliant Tournament from McGary helped Michigan break through Saturday night (AP Photo). It took 10 tries for John Beilein to beat one of the greatest coaches of all time, but when it finally happened, the one positive result – Saturday night’s five-point Final Four win over Syracuse – made every ounce of previous negative history feel like a distant memory. Beilein’s Wolverines did just enough over 40 minutes to topple the Tournament’s hottest and most challenging defense to date, and the next step (Lousville) involves an equally perplexing defensive puzzle. Mitch McGary stood tall amongst Syracuse’s unrivaled length and defensive pressure, and in the end, his passing out of the high post and rebounding efforts (12) made all the difference. When McGary wasn’t on the court, the Orange extended their zone and closed out on shooters and consumed any and all free space in the paint. Michigan’s offense stagnated, and just when the situation called for player-of-the-year-award-hoarder Trey Burke to put the game out of reach, his cold shooting (1-for-8) only exacerbated the situation. Michigan deciphered Syracuse’s 2-3 riddle despite Burke playing one of his worst games of the season, but against a team that mixes similarly frightening defensive prowess with a more competent offense (at least in this Tournament), Burke will need to rediscover the all-purpose talents that made him the best player in the country throughout the regular season. 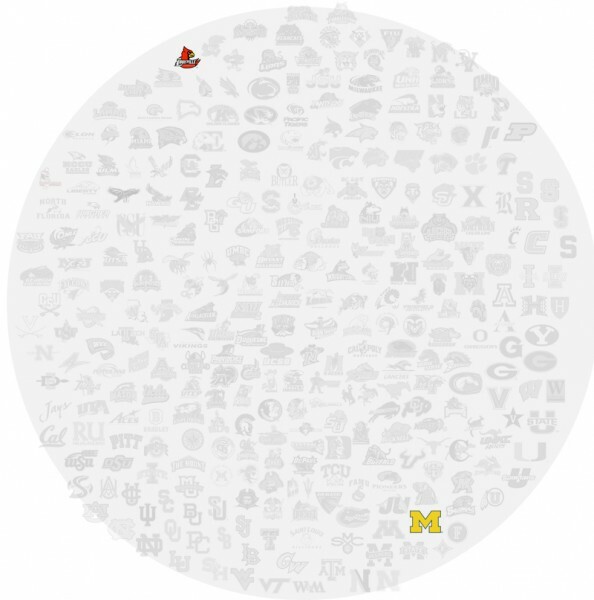 Before Michigan, the nation’s No. 1 efficiency offense, begins to even think about taking on Louisville, the nation’s No. 1 efficiency defense, the Wolverines can bask in the two decades-awaited opportunity to win a national championship. There were plenty of reasons to dismiss Michigan towards the end of the regular season. Its youth and lack of attention to defensive details were glaring flaws. Burke wasn’t good enough to carry everyone on his back. There was no reliable inside scoring presence. The Wolverines have answered all of those questions in a thrilling Tournament run that began with an opening-round slog against South Dakota State and added the latest unlikely chapter Saturday night. And with just one more stepping stone at hand, a strength-on-strength battle that shapes up as one of the most intriguing stylistic bouts we’ve seen all season, Michigan is well-suited to win its first national championship since 1989. All the regular season doubt has long been rendered misguided; Michigan’s here because it deserves to be. Few actually expected the Wolverines to reach this point, but now that they’re here, and McGary has turned into an All American-level star, and Michigan is winning games with Burke scoring two points, every conceivable outcome is officially on the table Monday night. Michigan Attacked the Zone, Sorta. As well as anyone has to this point, at least. And, really, only in the first half at that. In what became something of a night of unsung stars, the Wolverines got four threes from Spike Albrecht and Caris Levert in the first stanza, helping to make up for cold halves from their typical gunners, Nik Stauskus, Trey Burke and Tim Hardaway (2-of-11 in the first half). That trio didn’t get any better in the second half, finishing with a combined 4-of-18 night from beyond the arc, but the real key to beating the zone was the play of Mitch McGary in the high post. Michigan mostly looked offensively lost and tentative when McGary was out of the game, but even when he was on the court, the second half was mostly spent hanging on to a lead rather than aggressively trying to expand it. In other words, Michigan did just enough just enough times to beat the zone, and that’s still significantly more than the other teams not named Louisville have been able to do against it in the last three weeks. So… About Those Free Throws. Michigan should have won this game comfortably after taking a five-point lead and the ball into the final 1:10 of the game. Regrettably, the Wolverines missed five of its gimmes down the stretch (six, if you include one of McGary’s attempts that didn’t count) and that, combined with Michigan’s lack of timeouts (using the last one at 1:51 remaining), left a cavernous-sized opening available for the Orange. Ultimately, Syracuse had two chances in the final 30 seconds to either tie or take the lead and a questionable Brandon Triche offensive foul and an even more questionable decision by Trevor Cooney put an end to that mess in short order. 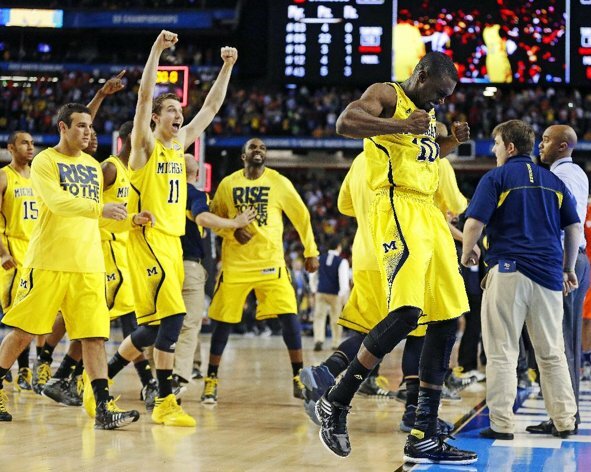 Michigan certainly put an exclamation point on the notion of survive and advance. No Shows. Syracuse was unlikely to win this game without another sterling performance from its oft-schizophrenic point guard, Michael Carter-Williams, and the prophecy came true. MCW delivered a real stinker of a two-point, five-turnover, five-foul game, which was too much for CJ Fair (22 points, six rebounds) and Brandon Triche (11 points, eight assists) to compensate for themselves. On a similar note, the Michigan starting backcourt was mostly awful as well, hitting only 5-of-29 from the field and contributing a total output of 20 points tonight. But special and equitable mention needs to go to everybody’s NPOY Trey Burke, who played a solid floor game (four assists, five rebounds), but couldn’t hit the broad side of a Georgia barn (1-of-8 from the field) in the dome tonight. It’s unlikely that he’ll have two awful shooting games in a row, so that’s something to keep an eye on heading into Monday night’s game with Louisville. Star of the Game. Mitch McGary, Michigan. No other choice here. He only had 10 points, but his 12 rebounds and six assists were absolutely vital to Michigan’s fortune tonight. Five of those rebounds were on the offensive end, no doubt contributing to the 14 second-chance points that the Wolverines were able to put down against the Syracuse zone. McGary’s six assists led to another 15 points, so if you do the math, you quickly understand that McGary had a hand in more than half of Michigan’s points tonight. And they really needed just about every one of them to hang on.